Playwright Aleshea Harris' play Is God Is, receiving just its second production at Minneapolis' Mixed Blood Theatre, is a revenge play. More than that, it's a revenge fantasy. Filled with the kind of vengeance that we don't resort to in real life because we're civilized people, but it sure is fun to think about. When you hear of a man who does horrible things to his wife and/or children, or even worse, experience it first hand, there's a part of the primal brain that wants to deliver an eye for an eye. This play is the cathartic fulfillment of those desires. It reminds me of the Dixie Chicks' song "Goodbye Earl," in which two friends conspire to kill the abusive husband of one of them. Critics cried - you're advocating violence and murder, how horrible! 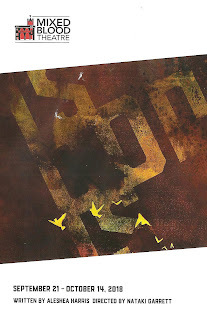 No - it's fiction, art, fantasy, metaphor, seeing an evil someone get what they deserve, if only in our imagination. Such is Is God Is, tenfold, in all its horrific yet somehow satisfying violence to avenge great hurts against one's self and loved ones. The story centers on two sisters Racine and Anaia, twins, burned and scarred in a fire 18 years ago. A fire that they thought killed their mother, until Racine receives an unexpected letter. It seems mom (whom the twins refer to as God because she made them) survived but has been in a "home for the weary" ever since, and is now finally dying from the severe burns she suffered in the fire. She tells them the true story of the fire, and asks them for vengeance against the man responsible - their father. So begins their journey to find their father and avenge their mother. To say any more would spoil the play, which includes surprises and shocks from delightful to horrific. It's a wild and crazy ride unlike anything I've experienced at the theater. The play is written in a unique style, with realistic language, and the convention of characters sometimes describing their thoughts or actions, which allows us to get inside their minds a little more deeply. Director Nataki Garrett gets great and specific performances from this terrific cast. In some ways this show is a two-hander, with peripheral characters wandering in and out of the twins' story. 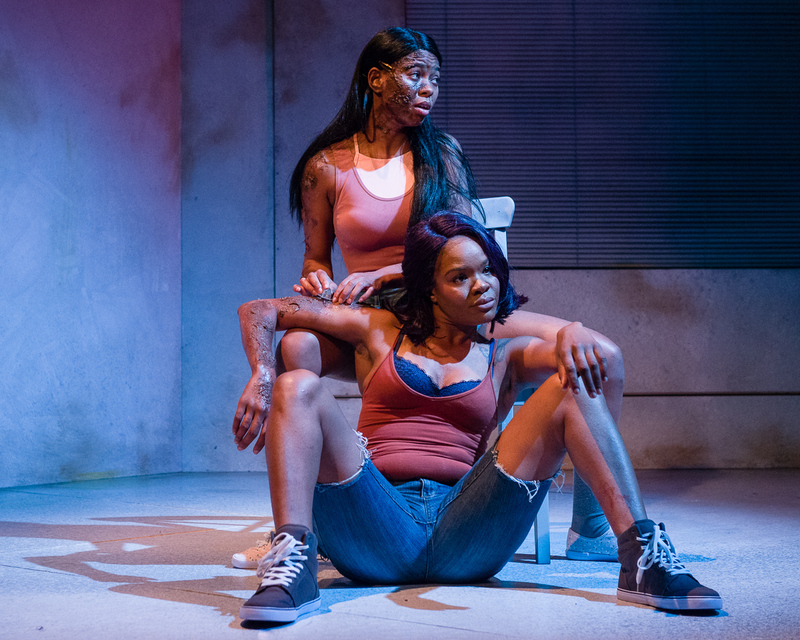 And it couldn't be in better hands than Dame-Jasmine Hughes as the tough sister (with her trademark fierceness) and Chaz Hodges as the sweet sister, who shows that she can be tough too when she needs to be. 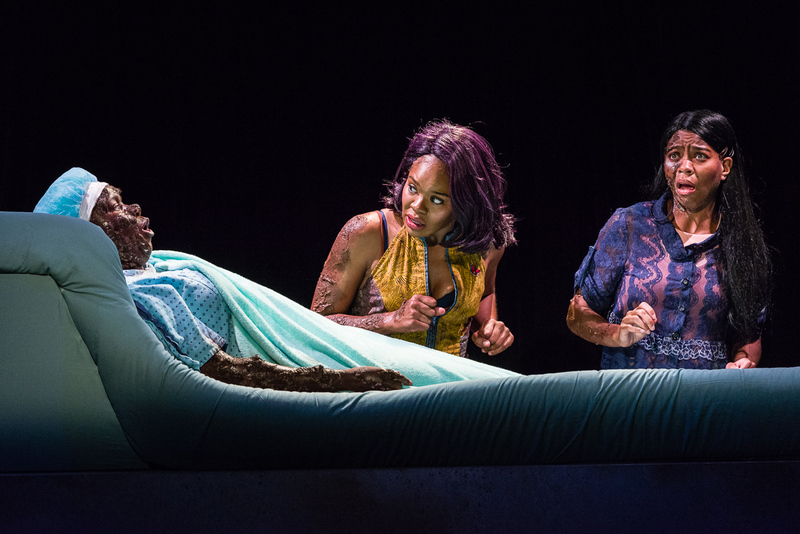 Playing their mother is a completely unrecognizable Joy Dolo, fierce and tough herself despite never rising from her bed. Their father is a tall and scary Kirkaldy Myers, the perfect embodiment of this enemy the girls have learned to hate. Jacob Gibson and Kory Pullam are adorable in different ways as the teenage twin brothers the girls unexpectedly find, and Jessica Rosilyn is sympathetic as their mother, another victim of their father. Rounding out the eight-person cast is Kevin D. West, making a brief but memorable appearance as the lawyer who defended the twins' father. This production includes some impressive tech effects that I don't want to say too much about, but make for some cool and sometimes scary theater magic moments. 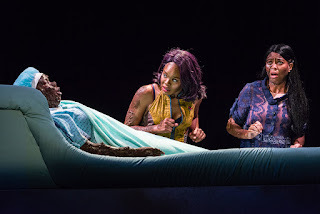 And it also makes me even more excited to see their upcoming production of Branden Jacobs-Jenkins Gloria (one-third of the "Prescient Harbingers" series), which also includes some very specific effects. I'd really like to say more about this, but you don't want me to ruin the surprise factor, trust me. So I'll just say kudos to the entire team including scenic designer Christopher Heilman, tech director Bethany Reinfeld, makeup designer Tessie Bundick, and fight/effects choreographer Bruce A. Young. Is God Is is a shocking revenge fantasy in which we get to imagine just ends for abusers, bullies, those who prey on people smaller, weaker, less powerful than they are. As a practitioner of non-violence I do not advocate the actions of this play in real life, and honestly some of it was difficult to stomach even in a fantasy setting. But there is something cathartic in seeing people get what they deserve, in a world where powerful men rarely seem to. And despite the serious and even tragic events of this play, there is a fun energy to it, with cast members smiling and dancing at curtain call. It's a fine line to walk between comedy and tragedy, and this team does it beautifully. Is God Is continues through October 14. I'll leave you with a quote from the director that describes it better than I can: "Is God Is explores the taboo of black female anger and the complexity of survival. It's terrifyingly funny and absurdly violent. It's about love and loyalty, sisterhood and rivalry."